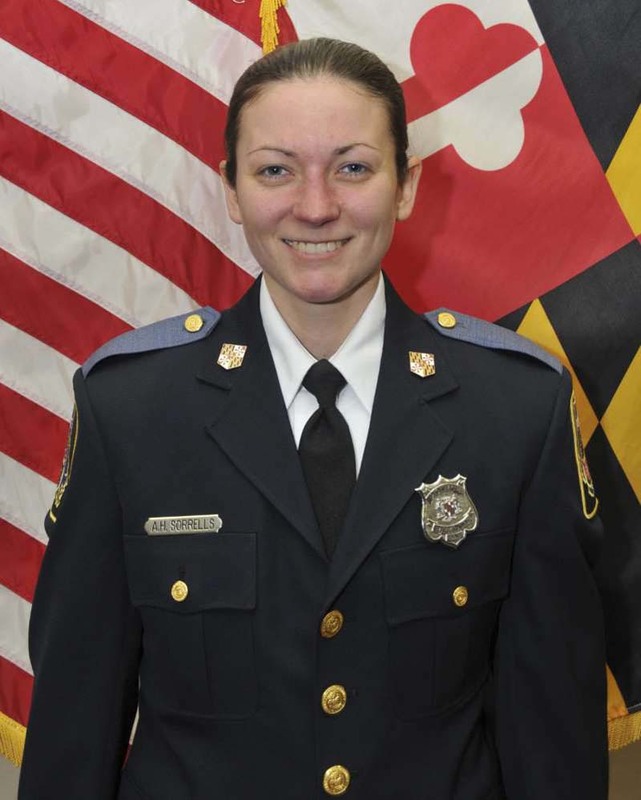 Baltimore County police have charged three more teenage boys as adults in the death of police Officer Amy Caprio, who was killed Monday while responding to a call in Perry Hall. Darrell Jaymar Ward, 15, Derrick Eugene Matthews, 16, and Eugene Robert Genius IV, 17 — all of East Baltimore — are each charged with first-degree murder and first-degree burglary. They were apprehended Tuesday morning, hours after police arrested 16-year-old Dawnta Harris and charged him with murder. Harris, of West Baltimore, is accused of running over Caprio with a stolen Jeep after being confronted by her, as Ward, Matthews and Genius were robbing a nearby home. Caprio, 29 and a nearly four-year veteran of the department, died a short time later at an area hospital. A viewing is scheduled for Thursday and funeral service for Friday. At a bail review hearing Wednesday afternoon, Distirict Judge Barbara Jung ordered that Matthews and Ward remain held without bail in adult facilities. Matthews and Ward waived their right to appear for the hearing, according to Gayle Robinson, the deputy district public defender. Genius asked for a postponement of the hearing because his private attorney wasn’t present, which Jung granted. His new hearing will be Thursday. In their argument for holding Matthews without bail, prosecutors cited his multiple prior offenses for armed robbery, conspiracy to commit a felony and other offenses, including car theft from March when he was placed on probation. Family for at least one of the teens attended the bail review, but declined to comment to reporters afterward. A handful of police officers, some in suits and some in uniform, also attended. Ward, Matthews, Genius and Harris are all being held at the Baltimore County Detention Center in Towson. None of the teens’ familes could be reached for comment Wednesday. Charging documents for the four defendants outline the series of events that police say led the Caprio’s death, and how they identified and located the suspects. Caprio had been called Monday afternoon to investigate a suspicious Jeep on Linwen Way in Perry Hall. A 911 caller reported that three people got out of the Jeep and had broken into a home, according to the documents. Police said Caprio came upon the Jeep and pursued the teen driver, whom they later identified as Harris, down the cul-de-sac. She got out of her patrol car, drew her gun and ordered Harris out, police said. Harris then ran over Caprio as she opened fire, according to police. Caprio was pronounced dead at the hospital shortly before 3 p.m. Monday. Medical examiners determined she died of head and chest trauma. A short time later, a 911 caller reported that the Jeep was abandoned nearby in the 9500 block of Dawnvale Road. A description of the driver was broadcast over police radio, and responding officers found Harris and stopped him about a block away, and he was taken into custory. Police identified Harris as the driver who struck Caprio by using the officer’s body worn camera video, which captured the incident. The department said the video will be withheld pending the trials for the four defendants. Police continued a large manhunt for the remaining suspects Monday night. County officers from specialized tactical, K-9 and helicopter units, along with officers from other agencies including Baltimore city police and the Federal Bureau of Investigation combed the Perry Hall area. Police also cordoned off the neighborhood surrounding the scene. Residents returning home from work Monday afternoon were turned away. Some slept at relatives’ houses or waited until close to midnight before officers escorted some residents to their homes. During an interview at police headquarters, Harris identified Genius, Matthews and Ward as the three suspects commiting the burglary at Linwen Way as Harris waited in the Jeep, according to charging documents for Genius, Matthews and Ward. They entered the home after shattering a rear sliding door and stole “numerous items,” the documents said. Genius, Matthews and Ward were arrested in the city Tuesday morning. During interviews at police headquarters, Matthews and Ward admitted to committing the burglary, according to charging documents. Genius initially declined to give a statement, and later objected to being charged with murder and said he was in the house when the murder occurred, according to the documents. Genius said he only knew two of the others involved, not all three, according to the documents. Baltimore County State’s Attorney Scott D. Shellenberger said state laws permit co-defendants in a crime to be charged with murder. He said one theory of proving first-degree murder is felony murder, which refers to a death that occurs during the commission of a felony. “All those committing the felony are responsible for the death,” he said. Warren Brown, an attorney respresenting Harris, said Wednesday that his client did not intend to harm the officer, but that he panicked, leaned down and attempted to drive away from the officer. Since the officer’s car boxed him in, Brown said Harris attempted to veer the vehicle to the right when he stuck the officer. Brown said the officer fired a shot that struck the windshield of the Jeep. Brown said Harris was frightened when the officer drew her gun. Defense attorney A.Dwight Pettit, who is not involved in the case, said Harris’ defense is similar to a 2001 case where he represented a teenager who stuck and killed a Baltimore city officer with a vehicle. “That’s practically the same defense we had. How do you get intentional premeditated murder when the person is fleeing? History repeats itself,” Pettit said. In that case, Baltimore jurors aquitted the teen on all charges. Baltimore Sun reporters Meredith Cohn contributed to this story.